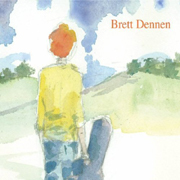 Brett Dennen's self-titled, debut full-length, originally released on Three Angels and a Saint Records, has been re-released by Flagship Recordings, distributed by Fontana/Universal. And rightfully so. This record deserves a wider audience. Dennen's unique guitar abilities (best described as quirky at times) and his ability to turn average folk into youthful exploration and down-home pop come alive on this record, making it's eleven tracks memorable from start to finish. I'll give it a B.